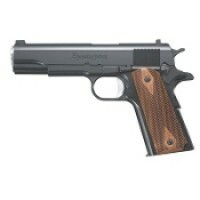 The 1911 pistol, designed by the most ingenious gunsmith of all times, John Moses Browning, still remains the most sought after handgun for concealed carry protection and competition shooting. 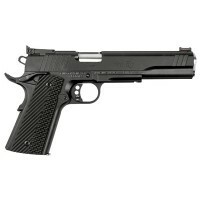 Single-action, semi-automatic, magazine-fed, recoil-operated pistol chambered for the .45 ACP cartridge, 1911 is the choice for many global military, law enforcement and commercial users. 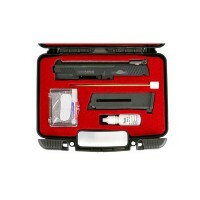 Whether looking to do a 1911 build kit as do-it-yourself project or purchasing a 1911 gun, Moriarti Armaments takes great pride in providing the very best that 1911 market has to offer. 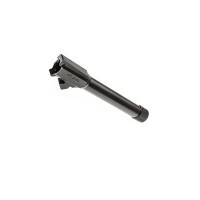 1911 .45 ACP 5" PISTOL BARREL, NON-RAMPED, 4150 STEEL1911 Barrel, 45 ACP, 5" Barrel, Fits 1911 Full Size Government, Parkerized Finish,Target crown - non threaded. 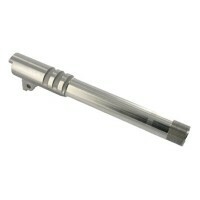 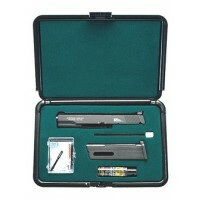 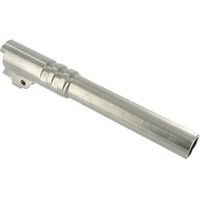 1911 .45 caliber 5 inch pistol barrels, 4150 with a Parkerized finish. 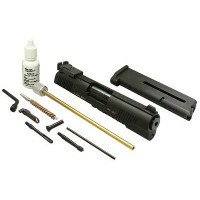 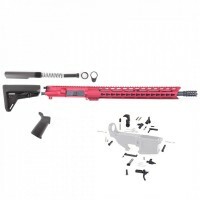 These barrels are made from a solid bar of 4150 gun quality ..
1911 22LR ADV ARMS CONV KIT COMMANDER Advantage Arms, Conversion Kit, 22LR, Fits Commander 1911, With Cleaning Kit, Black Finish, Target Sights, 1-10Rd MagazinePRODUCT SPECIFICATIONSUPC Code: 094308001029Manufacturer: Advantage ArmsManufacturer Part #: 191122CType: Conv KitCal..
1911 22LR ADV ARMS CONV KIT STANDARDAdvantage Arms, Conversion Kit, 22LR, Fits 1911, With Cleaning Kit, Black Finish, Standard Sights, 1-10Rd MagazinePRODUCT SPECIFICATIONSUPC Code: 094308001012Manufacturer: Advantage ArmsManufacturer Part #: AAC191122SType: Conv KitCaliber: ..
1911 22LR ADV ARMS CONV KIT TARGET SIGHTSAdvantage Arms, Conversion Kit, 22LR, Fits 1911, With Cleaning Kit, Black Finish, Target Sights, 1-10Rd MagazinePRODUCT SPECIFICATIONSUPC Code: 094308001005Manufacturer: Advantage ArmsManufacturer Part #: AAC191122TType: Conv KitCaliber:&n..
1911 45ACP STORM 5.75" SS THREADED BARRELStormLake Barrels, Barrel, 45 ACP, 5.75" Barrel, Fits 1911 Government, Stainless Finish, .578-28 Thread, with Link/Pin/BushingUPC Code: 848589006903Manufacturer: StormLake BarrelsManufacturer Part #: 34084Type: BarrelCaliber: 45 ACPBa..
1911 45ACP STORM 4.99" SS THREADED BARRELStormLake Barrels, Barrel, 45 ACP, 4.99" Barrel, Fits 1911 Commander, Stainless Finish, .578-28 Thread, with Link/Pin/BushingUPC Code: 848589004510Manufacturer: StormLake BarrelsManufacturer Part #: 34076Type: BarrelCaliber: 45 ACPBar..
1911 CARRY 45ACP SIG THREADED BARREL 4.9"
1911 CARRY 45ACP, SIG THREADED BARREL, 4.9"Sig Sauer, Barrel, 45 ACP, 4.9", Threaded, Fits 1911 Carry, .578-28, Link/Pin/BushingUPC Code: 798681457205Manufacturer: Sig SauerManufacturer Part #: BBL-1911-45-CARRY-TBType: BarrelCaliber: 45 ACPBarrel Length: 4.9"Accessorie..
Remington, R1 Commander, 1911 Commander, 45ACP, 4.25" Barrel, Steel Frame, Black Finish, Walnut Grips, Fixed Sights, 7Rd, 2 MagazinesUPC Code: 885293963368Manufacturer: RemingtonManufacturer Part #: 96336Model: CommanderModel: R1Action: Semi-automaticType: 1911Size..
Colt's Manufacturing, Delta Elite, Semi-automatic Pistol, 10MM, 5" Barrel, Steel Frame, Two-tone Finish, Composite Grips with Delta Medallions, 8Rd, Upswept Beavertail Grip Safety, Novak White Dot Sights - A Top 10 list of 1911s isn’t complete unless there is at least one made by Colt. 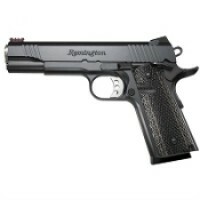 The new-..
Dan Wesson, Razorback RZ-10, Semi-automatic, 1911, Full Size, 10MM, 5" Barrel, Stainless Frame, Brushed Stainless Finish, Wood Grips, 8Rd, Fixed Night Sights - The razorback 10mm is a powerhouse perfect for deer and those big wild boars up close.UPC Code: 806703019079Manufacturer: Dan..
REM 1911 45ACP 5" 7RD BLK WLNT 2 MGS Remington, R1, 1911, Full Size, 45ACP, 5" Barrel, Steel Frame, Satin Black Finish, Walnut Grips, Fixed Sights,7Rd, 2 MagazinesPRODUCT SPECIFICATIONSUPC Code: 885293963238Manufacturer: RemingtonManufacture..
Remington, R1, 1911, Full Size, 45ACP, 5" Barrel, Steel Frame, Stainless Finish, Walnut Grips, Fixed Sights, 7Rd, 2 Magazines - This Remington is a beautiful 1911 offering the classic pistol in stainless steel. 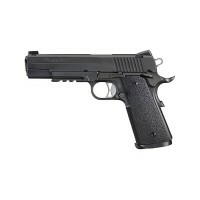 UPC Code: 885293963245Manufacturer: RemingtonManufacturer Part #:&nbs..
Remington, R1 Enhanced, 1911, 45ACP, 5" Barrel, Steel Frame, Stainless Finish, Walnut Grips, Adjustable Fiber Optic Sights, 8Rd, 2 Magazines, Target Trigger, Combat Hammer, Slide SerrationsUPC Code: 885293963290Manufacturer: RemingtonManufacturer Part #: 96329Model: R1 EnhancedAc..
Remington, R1, Hunter Long Slide, 10MM, 6" Barrel, PVD DLC Finish Steel Frame, VZ Premium G10 grips, Adjustable Sights, 2 Magazines - With a 6-inch barrel, G10 grip panels, an integral accessory rail and the oil-rubbed bronze finish, Remington’s new 10mm R1 Hunter is a potent tool for hunting f..
Cartridge: 45 Auto (ACP) Action Type: Single Action Barrel Length: 5" Frame Material: Carbon Steel Frame Finish: Black Oxide Slide Material: Carbon Steel Sights: Fiber Optic Slide Finish: Black Oxide Grip Type: Black Laminate No. 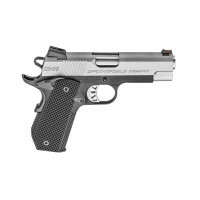 of Magazines: ..
AS FEATURED BY SHOTSHOW 2017Ruger, SR1911, Centerfire Pistol, 45ACP, 5" Barrel, Low-Glare Stainless Slide & Frame, Stainless Steel, Drift Adjustable Novak 3-Dot Sights, 8RdUPC Code: 736676067008Manufacturer: RugerManufacturer Part #: 06700Model: SR1911Action: Semi-automa..
Sig Sauer, 1911 TacOps, Full Size, 10MM, 5" Barrel, Alloy Frame, Black Finish, Ergo Grips, Fixed Night Sights, 8Rd, 4 Magazines, Tac RailThe SIG Sauer TACOPS (which stands for Tactical Operations) 1911 came out a year or so ago in .357 SIG and .45 ACP, but for 2017 it’s being chambered for 10mm Auto..
Springfield, EMP, Champion, Semi-automatic, 1911, Champion, 9MM, 4", Alloy, Bi-Tone, G10 Grips, 9Rd, 3 Mags, Ambidextrous, Fiber Optic Front & Low Profile Combat Rear Sights - The new-for-2017 version is the EMP4 with Concealed Carry Contour. 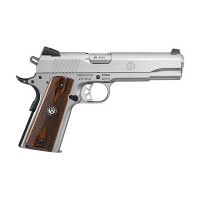 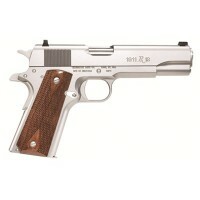 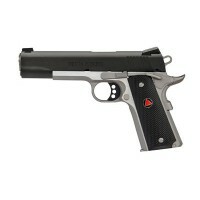 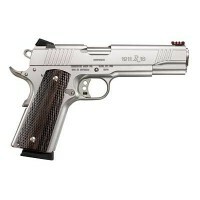 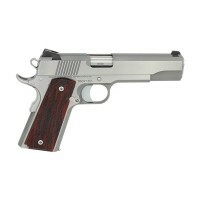 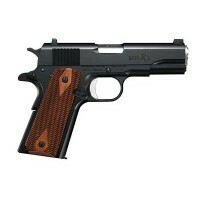 This little 9mm 1911 has a full-length grip fram..